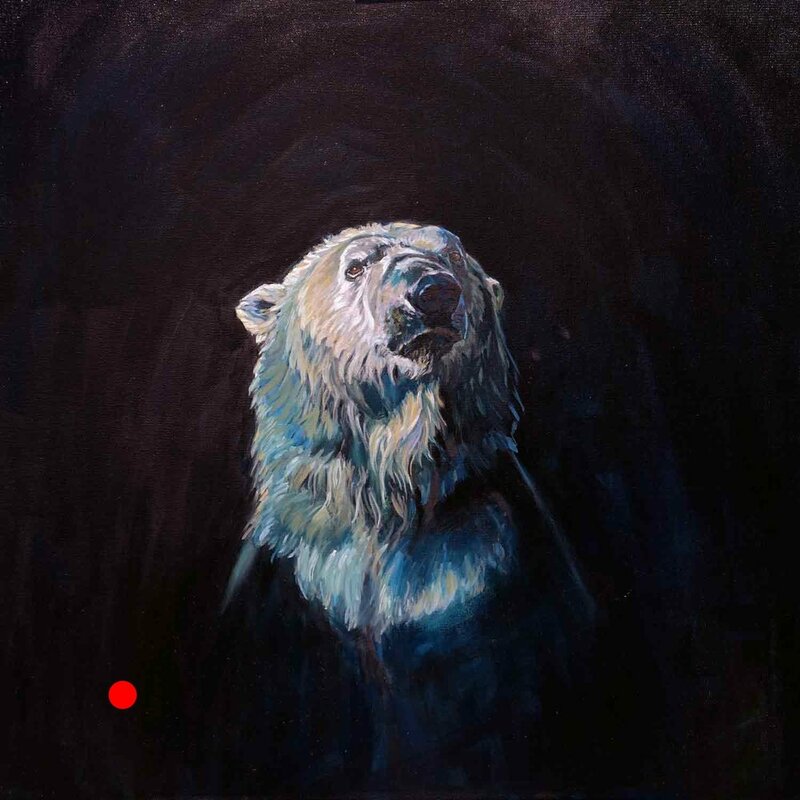 In this new series of polar bear portrait oil paintings on canvas, a beautiful polar bear is portrayed against the setting sun, and the arctic sea. It is spring. The polar bear’s solitary journey in search of seals, a mate, and shelter on the sea ice is coming to an end for another year. The darkness of the arctic winter day vanishes along with the sea ice. Sunshine returns and so do the glorious big sky sunsets. 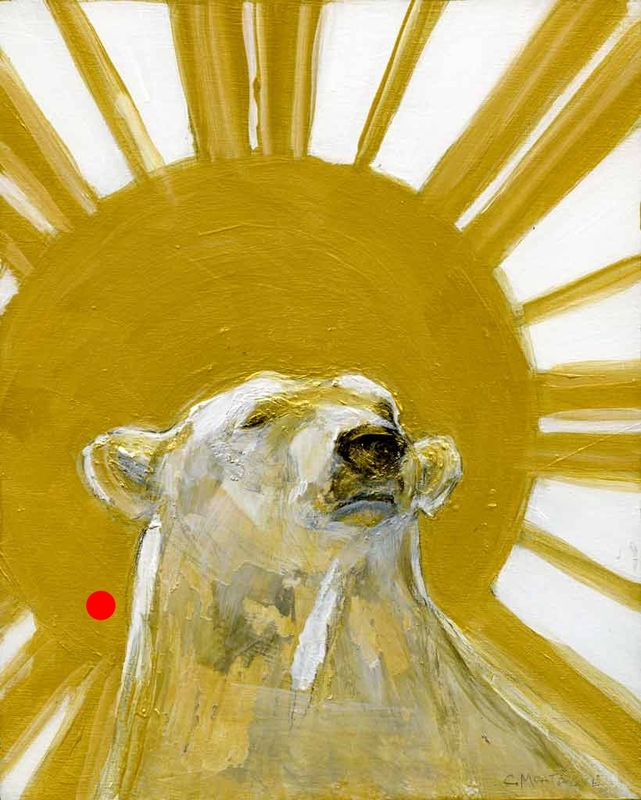 As the day draws to an end, the sun’s glory is reflected off the open water, the remaining ice, and the polar bear's translucent fur - sea, ice and polar bear connected by its light, colour and warmth. We can reflect, too. What will we lose under the threat of climate change? A setting sun offers hope with a new day ahead, but "into the sunset" can also signify the end. 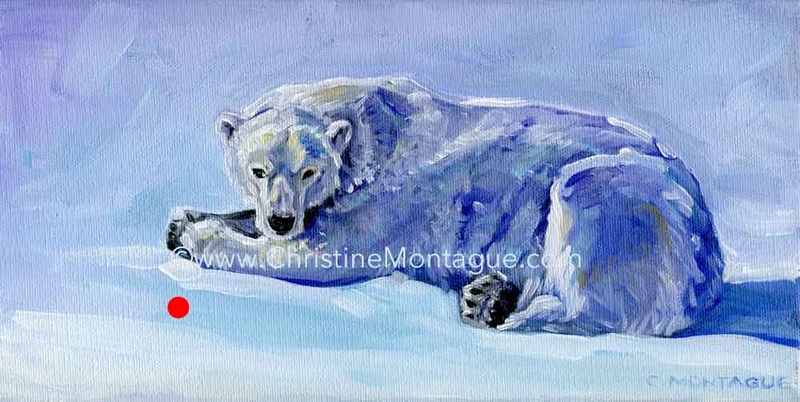 This is the first polar bear painting in the new series . Let me know what you think. 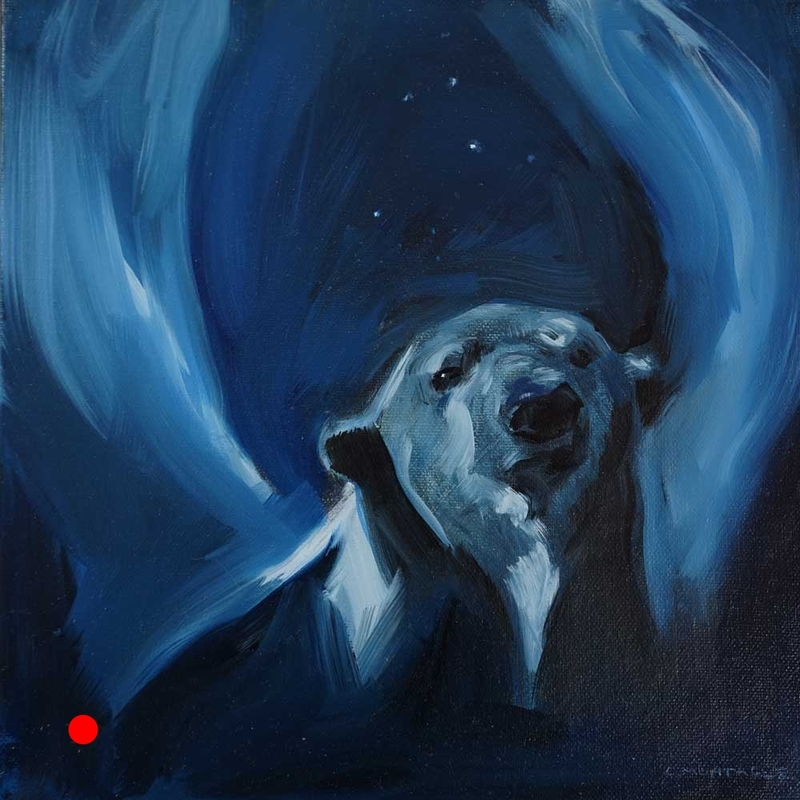 The Fall is a portrait of a polar bear on its solitary journey in the arctic night, unaware that a red maple leaf (Canada’s national symbol) falls before it from above. 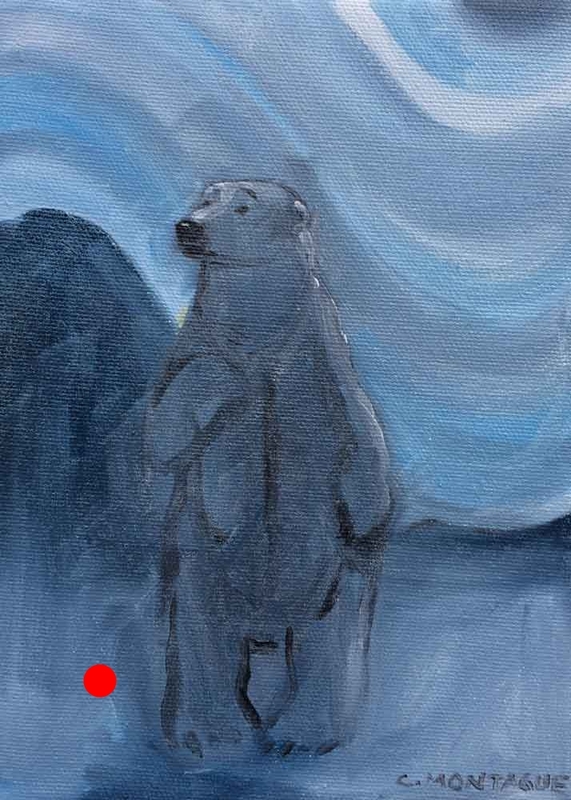 The fall colour of the maple tree isn’t part of this bear’s autumn landscape, but the frozen sea, so vital for its survival, is. 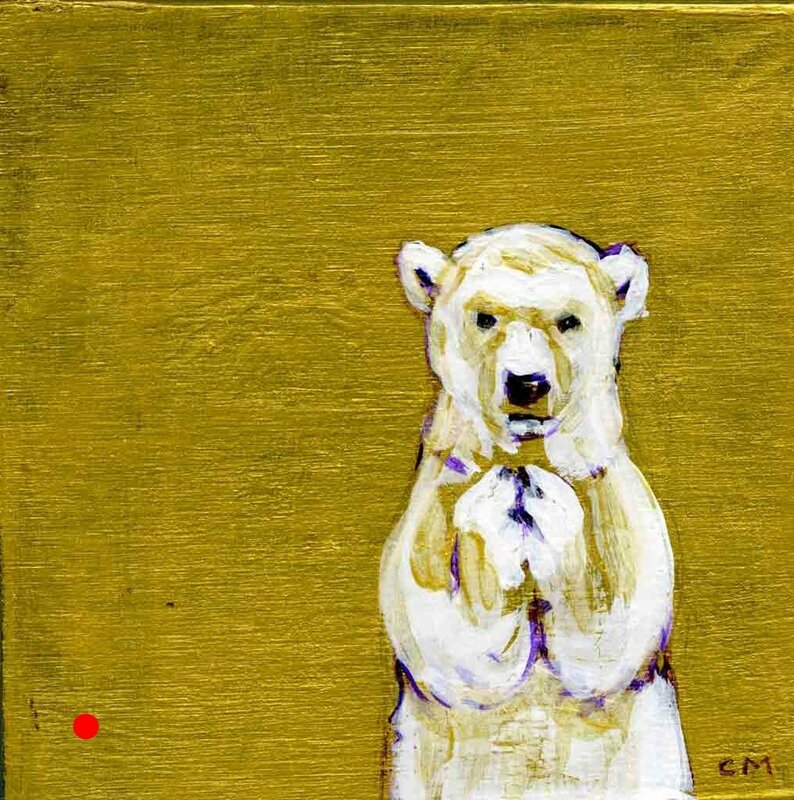 Increased periods of open water from spring to fall, due to climate change, increases the polar bear’s vulnerability. 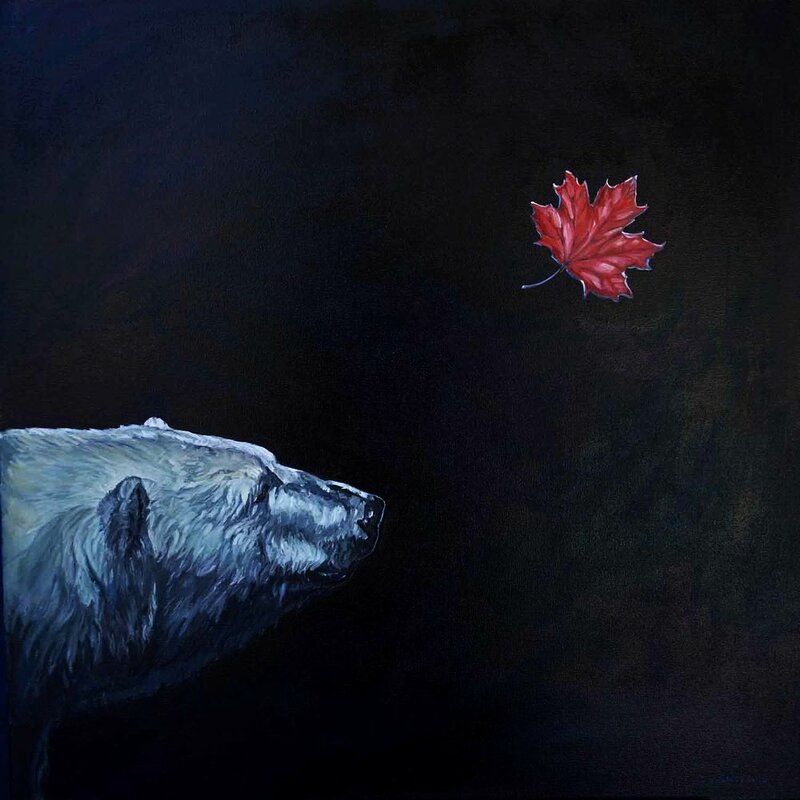 Painted in wonder and warning,The Fall pays tribute to an iconic Canadian animal, and connects Canadians in the responsibility to protect it, thereby protecting and saving ourselves. 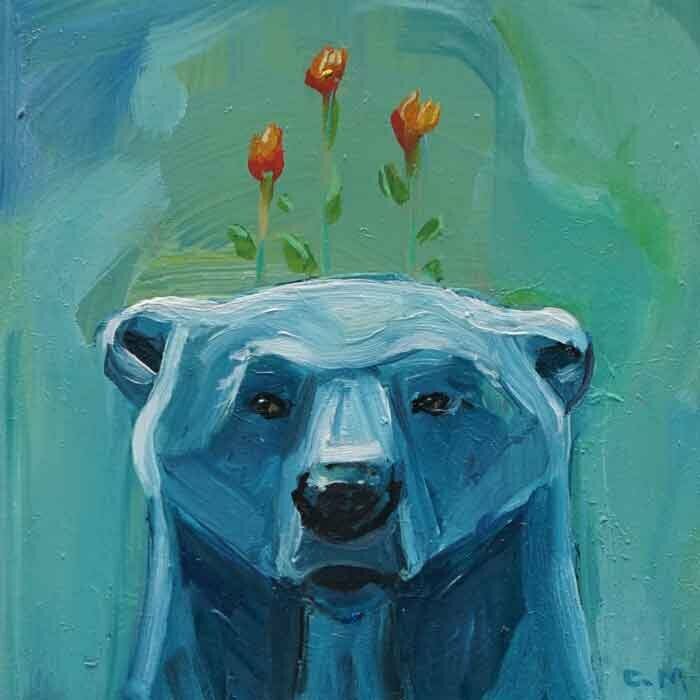 My polar bear oil painting Canadian Flower Crown was accepted in, and was awarded 1st prize, The Jurors’ Award, the respected Headwaters Arts Annual Juried Art Show, (on until October 8, 2018) Headwaters Arts Gallery, Alton Mill, Caledon. 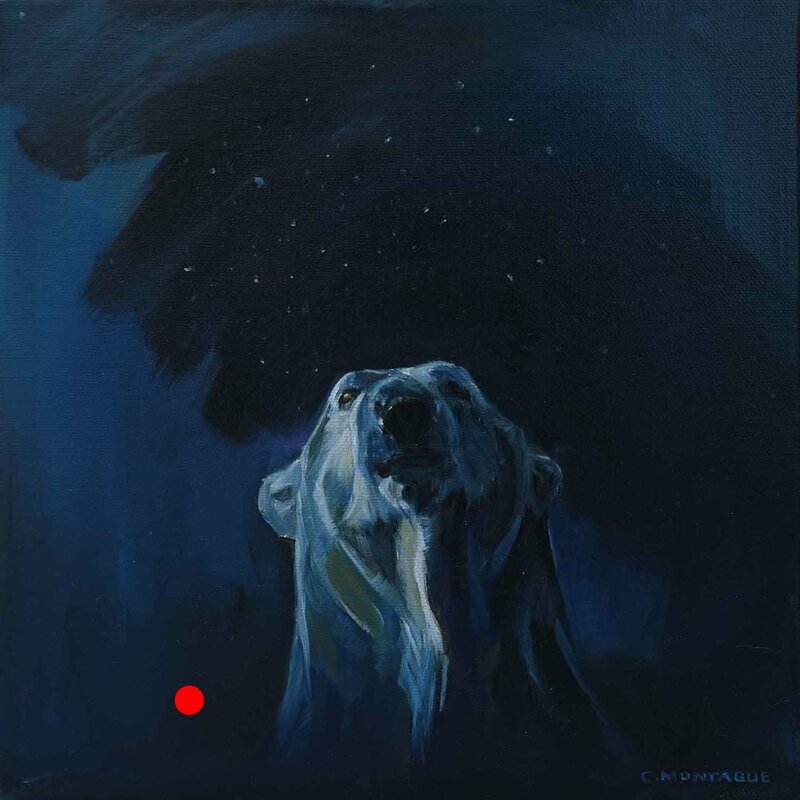 It was an honour for me, that my polar bear painting about tribute and celebration of this magnificent animal, received a tribute of its own! Jurors Sue Powell, Regan Hayward, artist Christine Montague, and juror Jill Price with Canadian Flower Crown at the Jurors walk, Headwaters Arts Gallery, Alton Mill, Ontario, Canada. 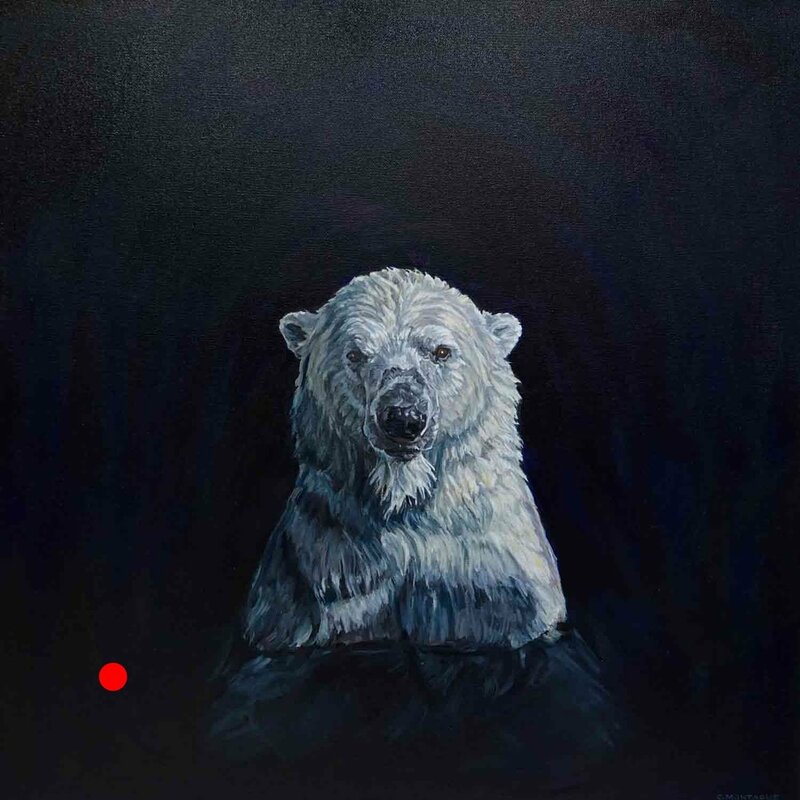 It was especially gratifying and encouraging that not only did the accomplished jurors, Sue Powell, Regan Hayward and Jill Price, accept my polar bear painting into the show, but that they so clearly understood its message. 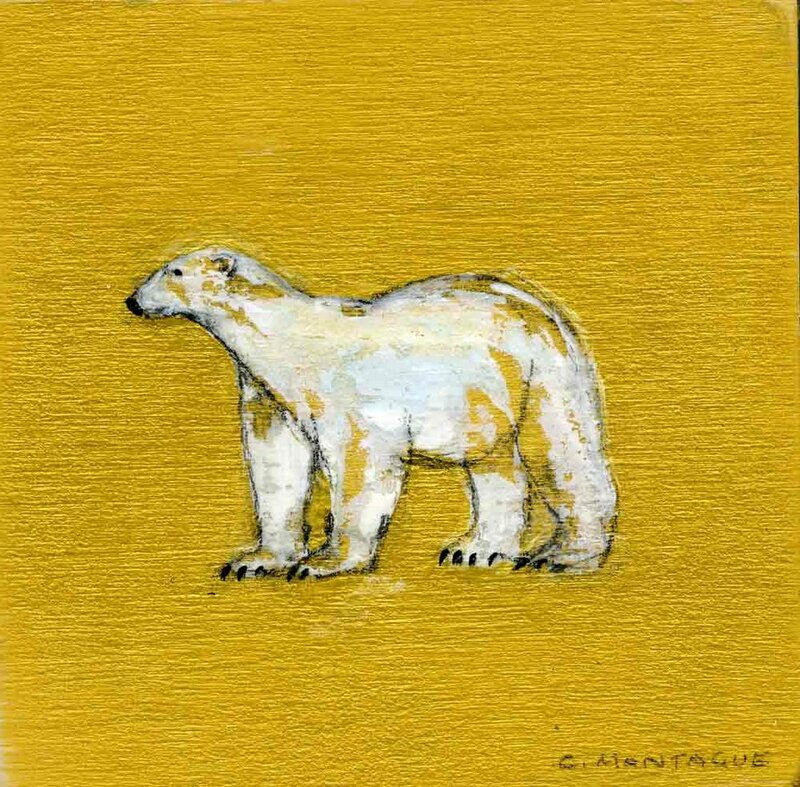 The effect of climate change, particularly vanishing sea ice is central to all my art work. 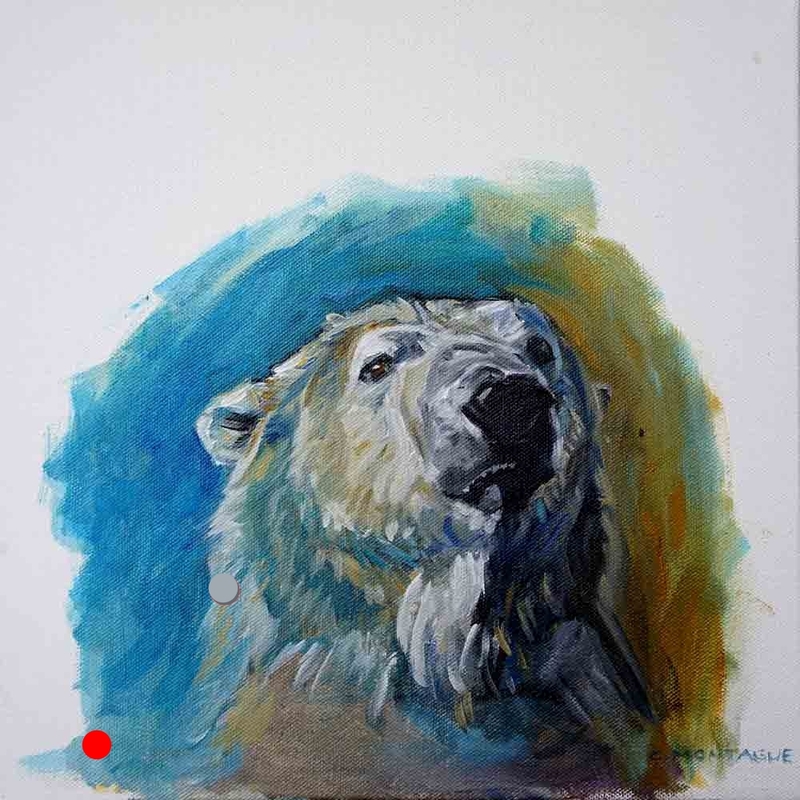 In this polar bear portrait, a solitary bear is adorned in honour and celebration with a flower crown composed of the flowers of the Canadian provinces and territories, as well the nation’s symbol, the maple leaf. The polar bear is one of the world’s most loved animals, but it is Canada, that is home to 60 - 80% of the polar bear population. 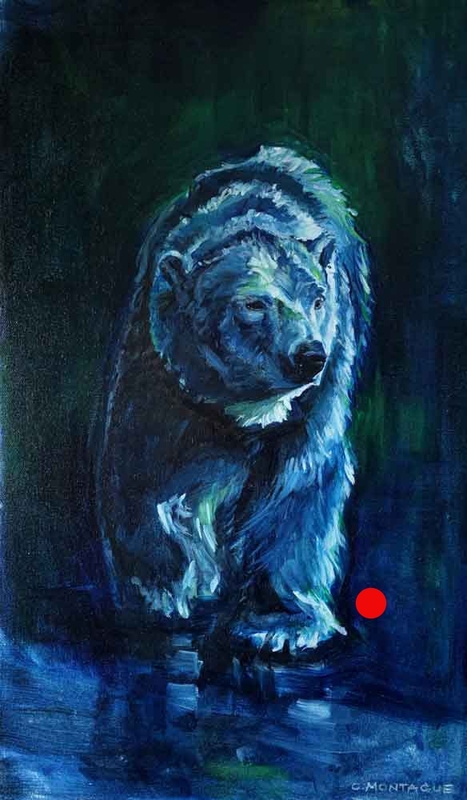 This magnificent, highly intelligent bear is significantly intertwined with the Canadian identity, and yet, its status in Canada, is vulnerable. Canadian Flower Crown, although a recent creation, was one I had in the works in my head for a few years. I was often surrounded by beautiful flowers, especially magnificent flower crowns, as my daughter was a floral designer. Keeping her company I would doodle, and flower-crowned polar bears made their way on the page. 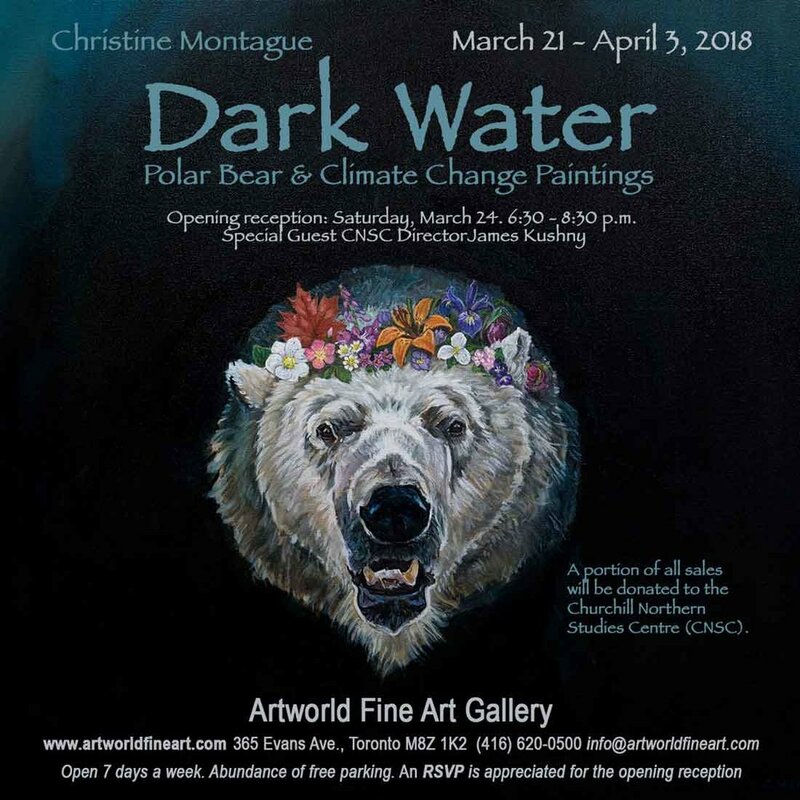 But it wasn’t until I started to create my work for my 2018 Dark Water solo exhibit, that a flower crown polar bear insisted it appear on canvas. 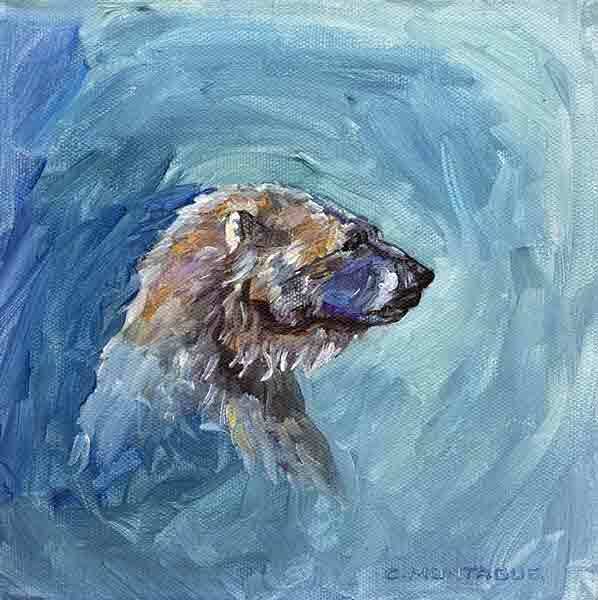 It became a mental block to my creating new paintings that were to be of polar bears in dark water. The only way to solve this, was to paint it, so I could get on with the show! Canadian Flower Crown took more research and planning than most of my paintings. 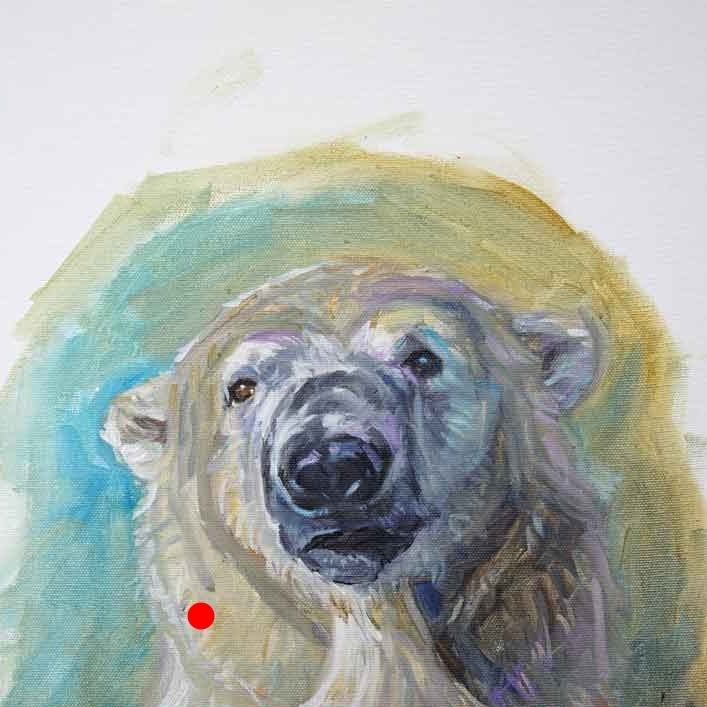 I had learn what the flowers of each province and territory are, their size, and their proportion in relation to a polar bear’s head. 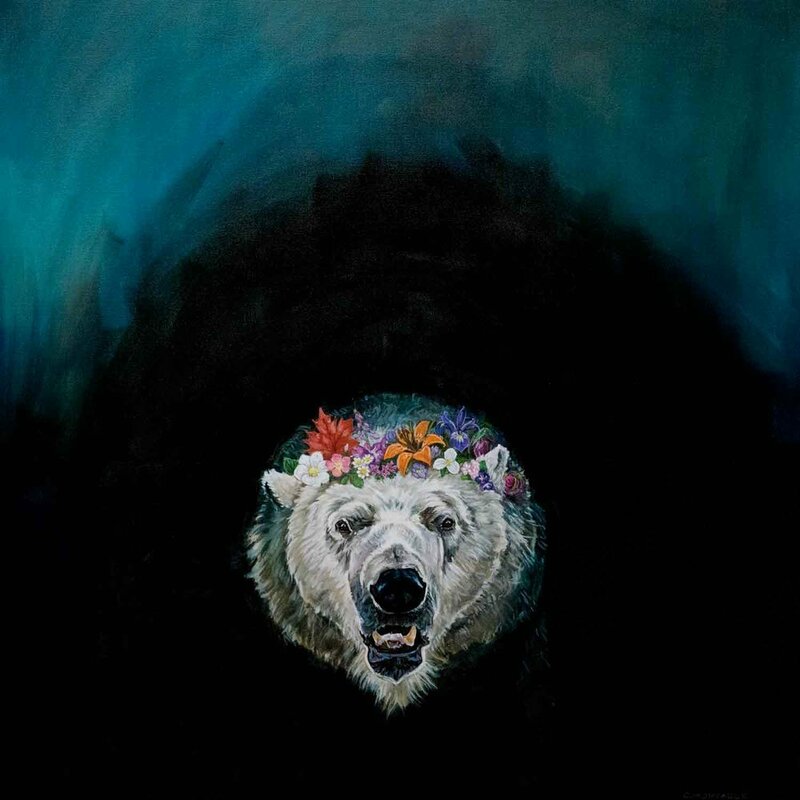 It would be so easy for this bear to be “cute” or “pretty” in a flower crown. By showing its very large teeth, this polar bear remains the powerful animal it is. You are invited! 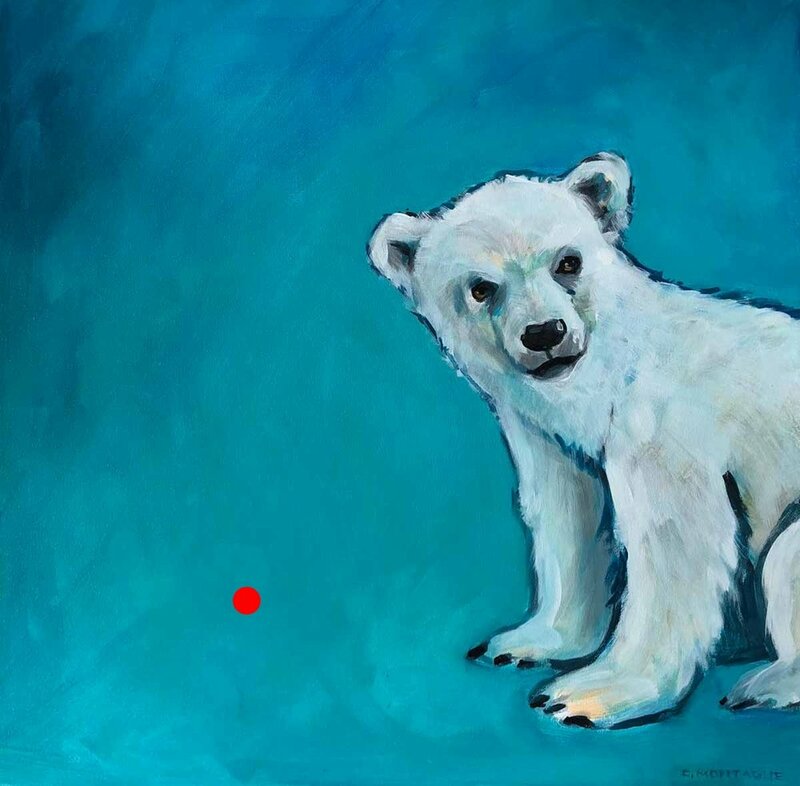 Below is the invitation to my solo show of new paintings about polar bears and climate change. Special Guest: James Kushny, a University of Toronto researcher, and Board Director for the Churchill Northern Studies Centre, the remarkable, Leed certified centre in Churchill, Manitoba, where scientists from around the world, study northern sustainability . A portion of sales will be donated to this independent, not for profit, Canadian research centre. An RSVP for the opening night would be appreciated. For more info, directions or to RSVP please click here. 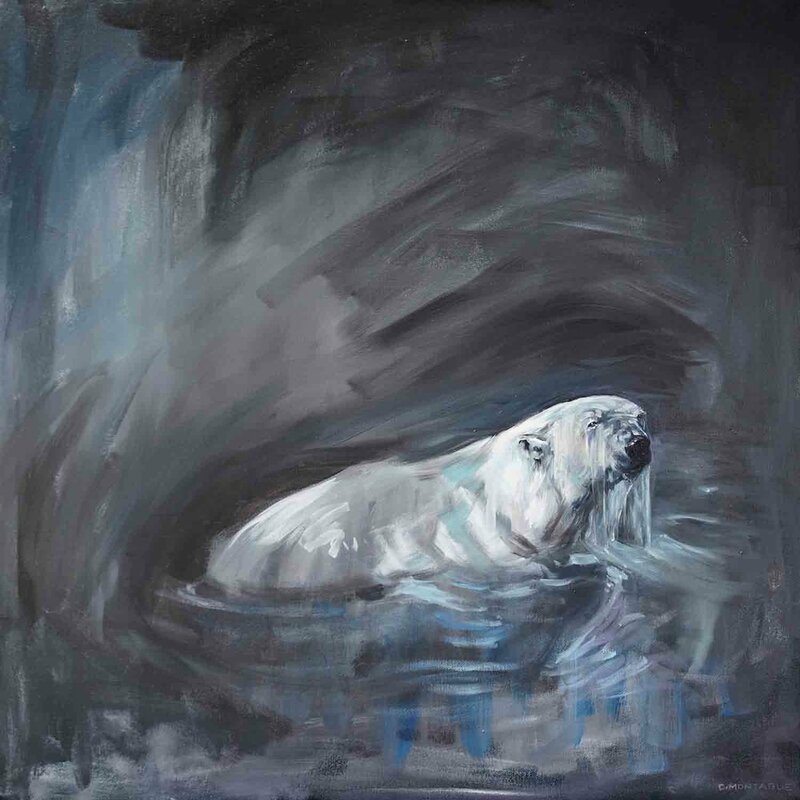 Dark Water 1 is an oil painting portrait of a beautiful polar bear swimming. The water is dark, as daylight is diminished in the arctic fall. 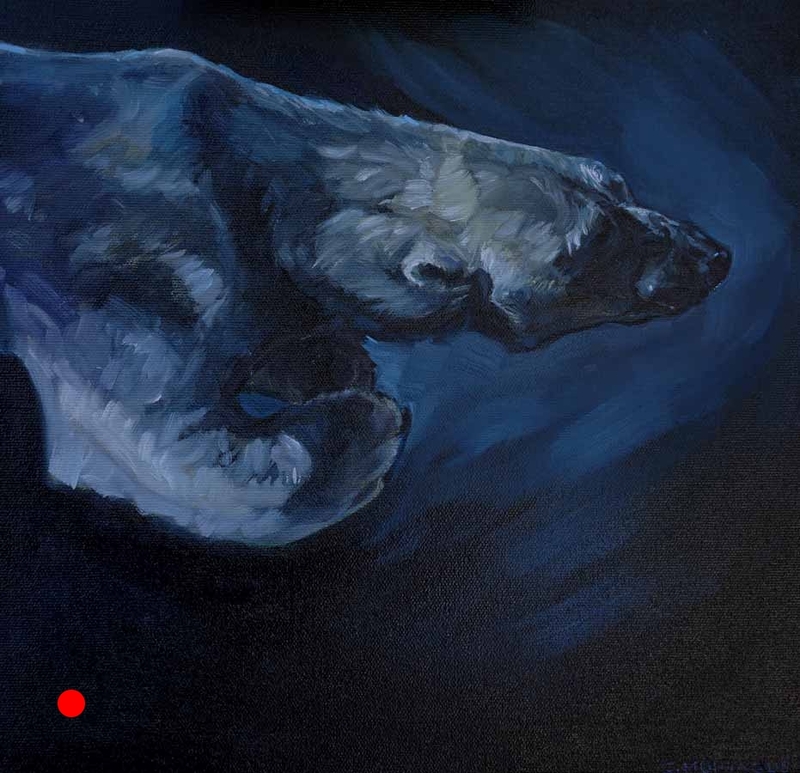 Polar Bear in Dark Water. 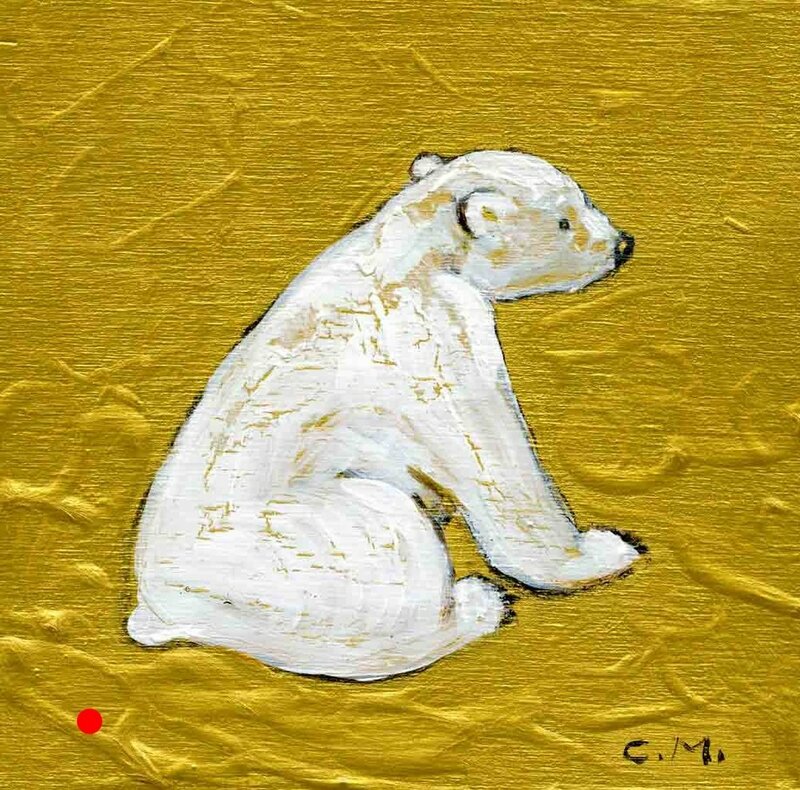 ©Christine MontagueAvailable at Artworld Fine Art Gallery until July 20, 2017. 365 Evans Ave. Toronto, Ontario, Canada. But dark water has another implication. The earth’s bright white polar ice cap, which serves as a giant reflector for the sun’s heat, is being diminished by climate change from carbon emissions. The melting polar ice increases the darkness of the planet’s surface (hence “dark water”), decreases the sun reflected back into space, and increases the heat absorbed by the earth. More ice melts, which creates more dark water, and so the loop continues. 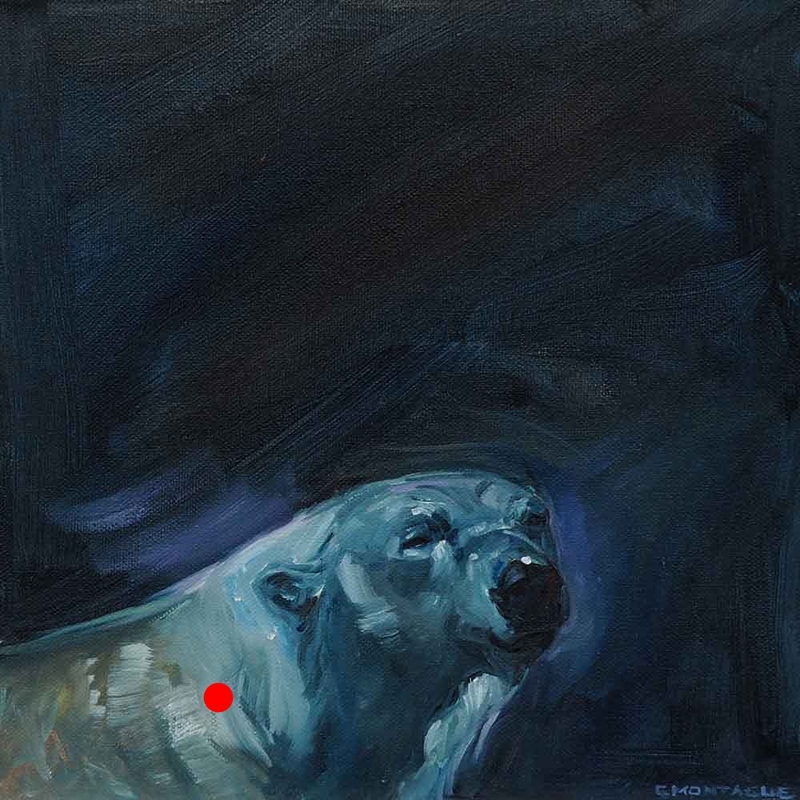 This loop of sea ice loss and increased dark water endangers the polar bear. 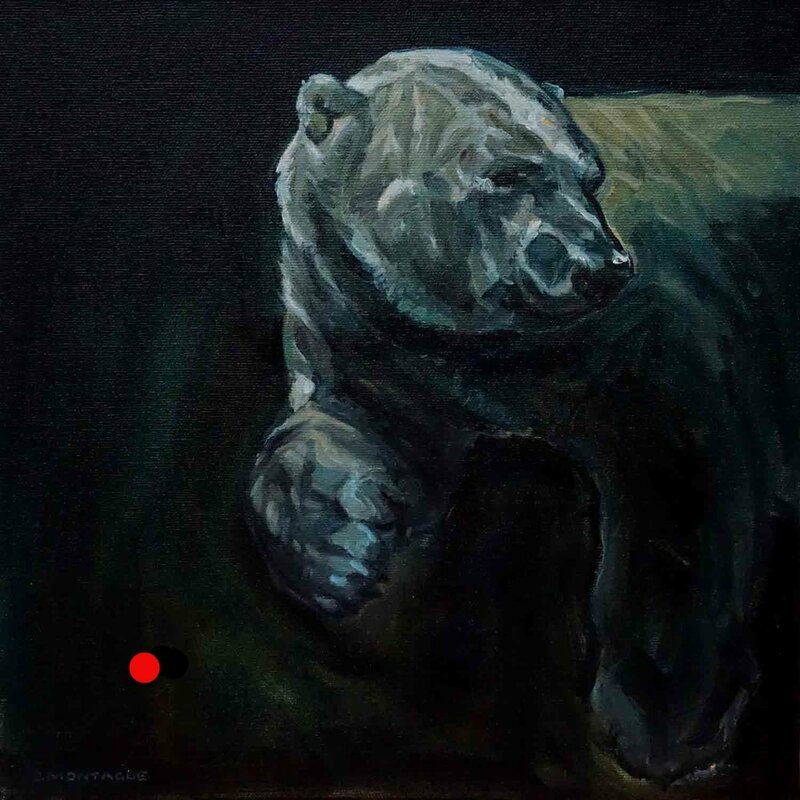 Although this magnificent bear is a highly intelligent (think great ape), top-of-the-arctic-food-chain marine mammal (the only bear that is such), and is a powerful swimmer (slightly webbed front paws, highly insulated and buoyant body), it is dependant on the frozen sea for hunting (only seal fat sustains them, not berries or birds’ eggs), resting, feeding (can’t nurse in water) and denning (necessary for mother bears with cubs, semi-hibernation, and to ride out storms). 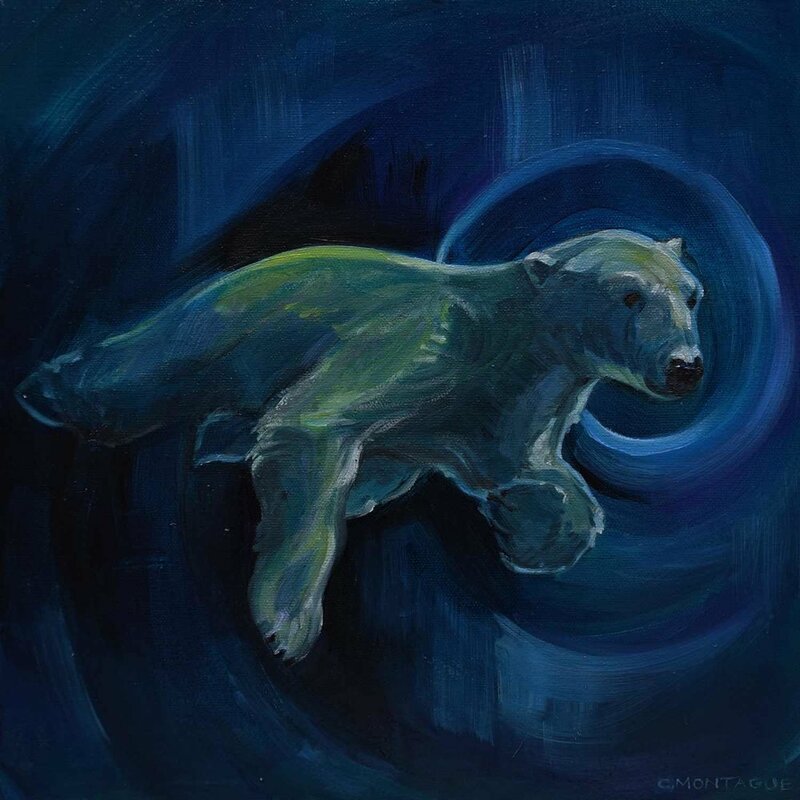 The increase of the period of open water from spring to fall, and the distance between ice tops in winter, leaves the polar bear and its cubs vulnerable to starvation, attack, and drowning. 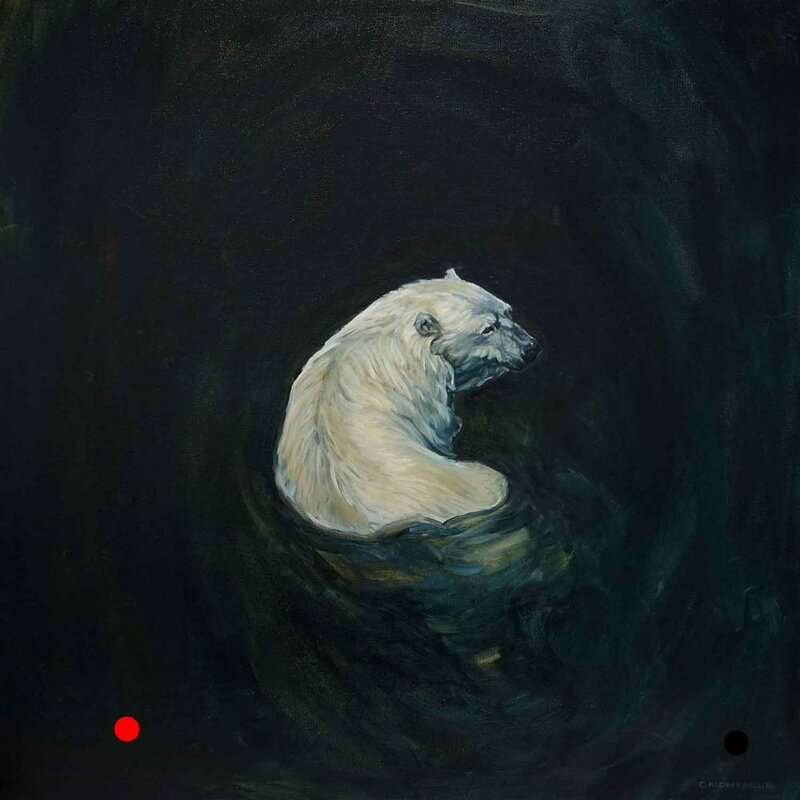 The polar bear in Dark Water 1 gazes back upon her path, her body twisted as if in question. It is up to the viewer to imagine how far outside the picture frame the next ice floe waits, and whether or not, until this moment, her journey was a solitary one. 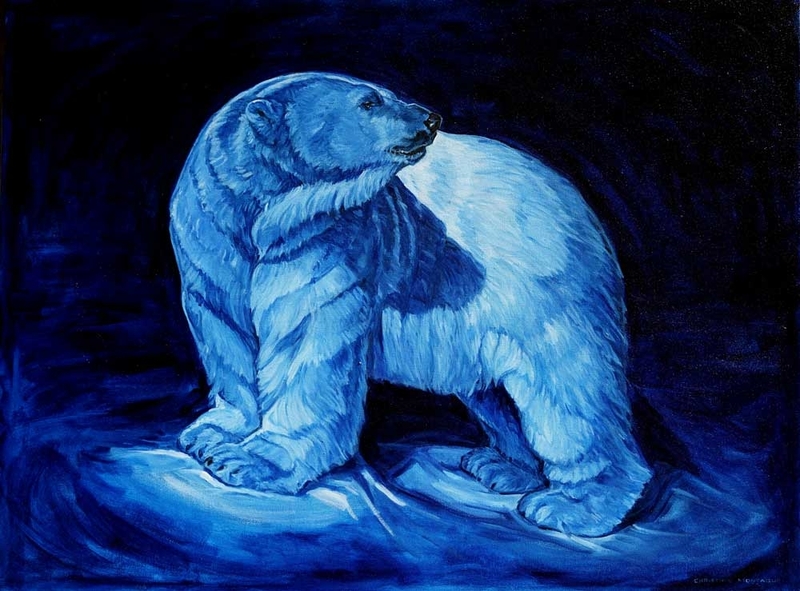 Meet The Blue Prince, a 30" x 40" polar bear oil painting. 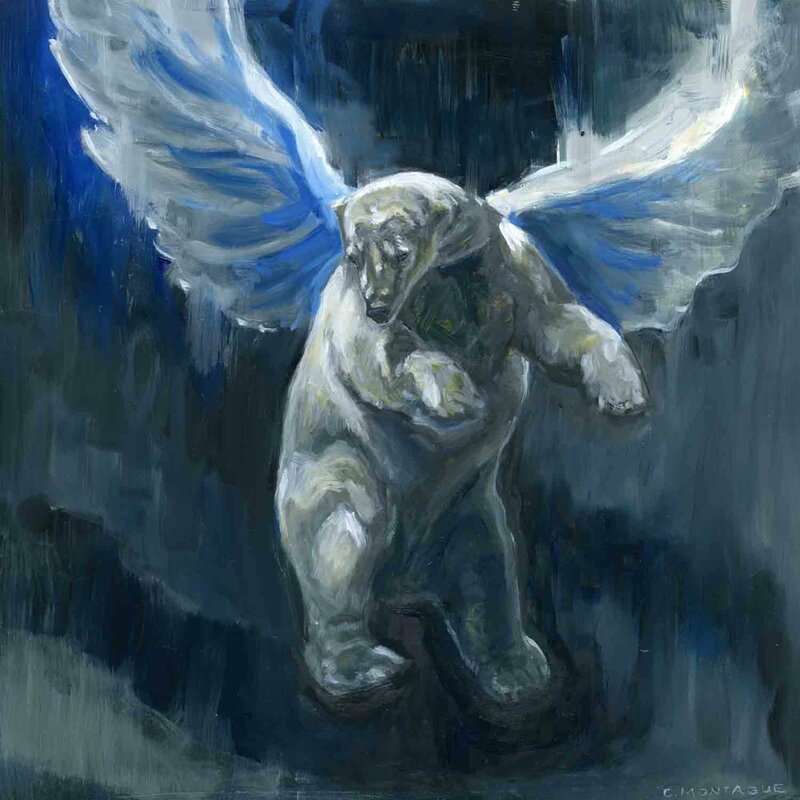 Why have I titled this painting, The Blue Prince? 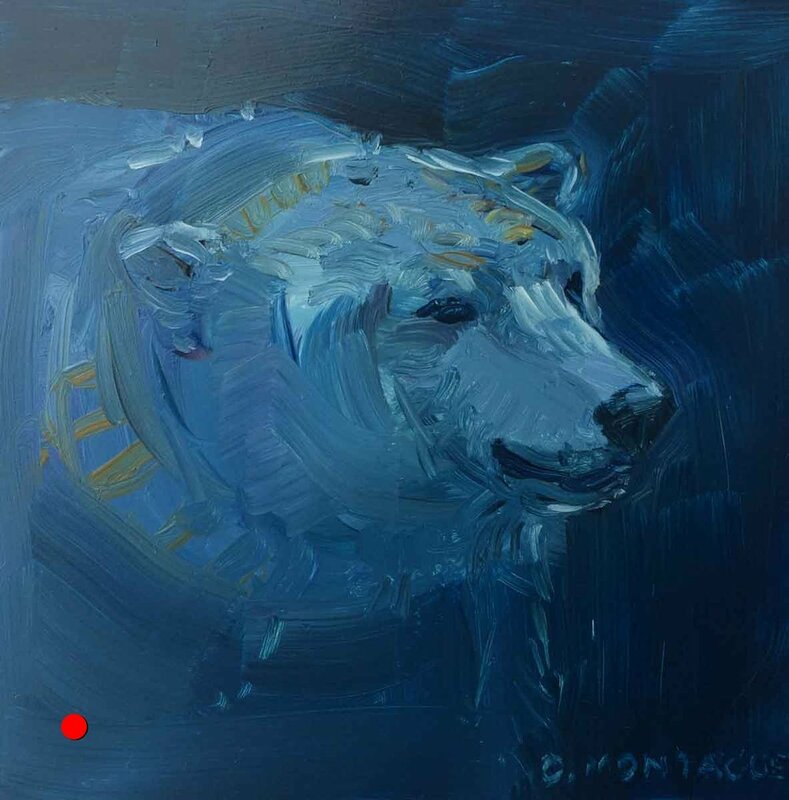 ...this mighty polar bear painting is created in dramatic shades of blue,.. is a portrait of arctic royalty, and polar bears, highly intelligent, and the largest and mightiest arctic predator, are often referred to as the Lords of the North. 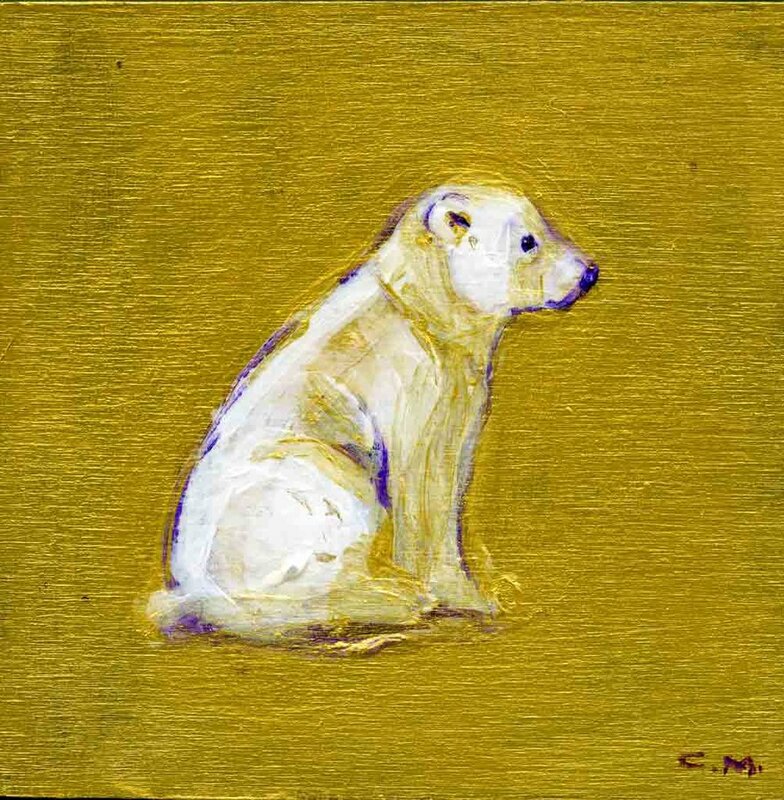 The polar bear cub painting below, is the second in my Sink/Swim series of polar bear oil paintings. 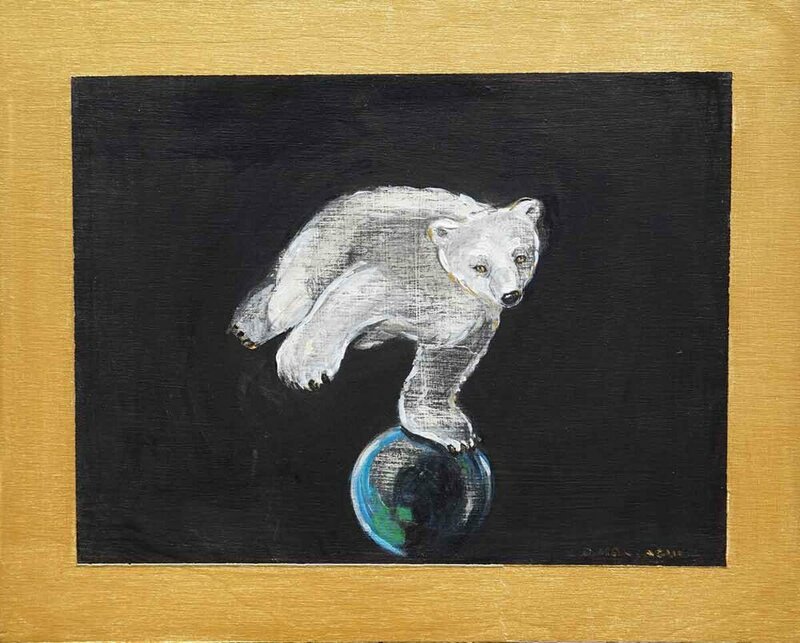 This painting comments on sea ice loss and its negative effect on the polar bear habitat. ©Christine Montague. Sink/Swim 2. 12" x 6" oil painting. Climate change has decreased the amount of sea ice necessary for the mother bears to hunt seals, feed their young, and sometimes den. The season of open water from spring to fall has increased, delaying the opportunity to hunt. Cubs do not yet have that great insulating layer of fat and so the mother bear must carry the baby bears on her back as she swims to the next ice top. These trips are not always successful. Polar bear cubs just simply vanish along the route, and sometimes the mothers do, too. 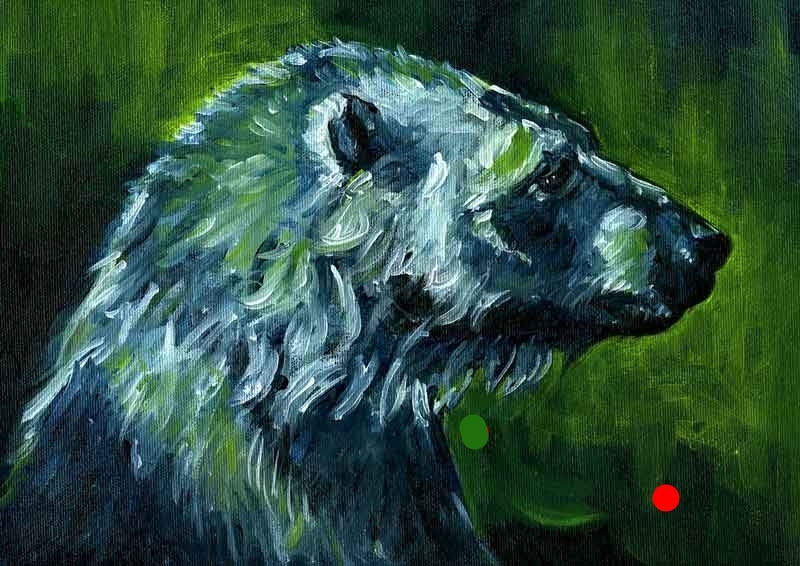 The bear cub above, does not seem distressed. 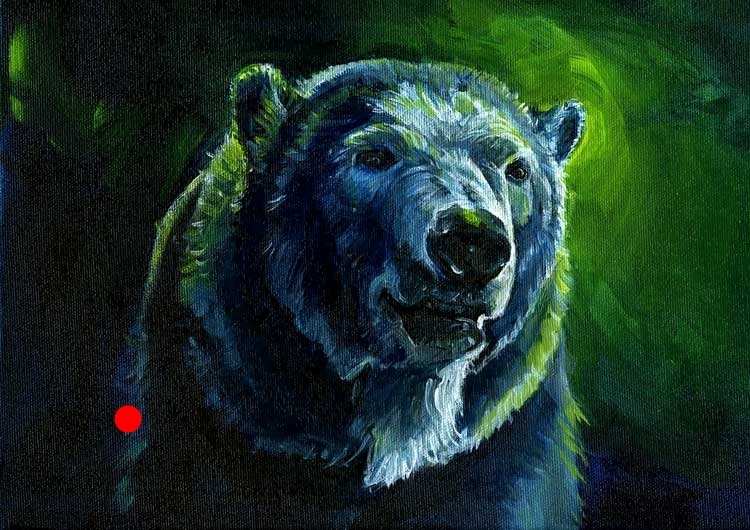 Like with the experiment Schrodinger's Cat, it is up to the viewer's thoughts about what this bear's state of being is.